We believe the recent update from Geron (NASDAQ:GERN) was definitely negative. Despite Geron’s claim that the overall survival seen so far in the IMbark trial is very promising, we believe the median overall survival (mOS) for the imetelstat group is not unusual given the baseline health of the IMbark patients. We also believe that Geron provided evidence that imetelstat has no impact on survival by disclosing that there was no difference in median survival detected so far in either dosing arm. The update only served to confirm our view of imetelstat’s likely failure and our expectation that partner Janssen (NYSE:JNJ) will terminate its licensing agreement. The big takeaway that investors seemed to have had from Geron’s recent update was that with a median follow up of 19 months at the time of the January 2018 data cut, median overall survival had not been reached in either dosing arm in the IMbark trial. Geron further stated the greater than 19 months of median overall survival looked promising since published clinical and real-world studies estimate that median overall survival after discontinuing JAK inhibition therapy is approximately 14-16 months. Analysts such as from Stifel went further and stated, “As the 19 month follow-up was conducted in January, this suggests a potential ~22-24 month median overall survival in patients taking imetelstat.” Investors ate up the news, driving the shares up over 50% to 52-week highs. We think investors are overlooking the fact that the patients in the IMbark trial are healthier than the trials to which Geron compared them. The IMbark trial’s inclusion and exclusion criteria explicitly state that only ECOG 0-2 patients can be enrolled and that patients with a peripheral blood blast count of >= 10% are to be excluded. The trial excluded ECOG 3 patients, who are capable of only limited self-care and are confined to a bed or chair for more than 50% of their waking hours. We also know that myelofibrosis (MF) patients with peripheral blood blast count of >=10% have shorter overall survival. Based on stated trial criteria, we have concluded that the IMbark trial did not include very sick patients. Geron provided additional information on the 4Q 2017 conference call when in response to a question, Geron revealed that IMbark patients “required at least 75,000 platelets” per microliter. 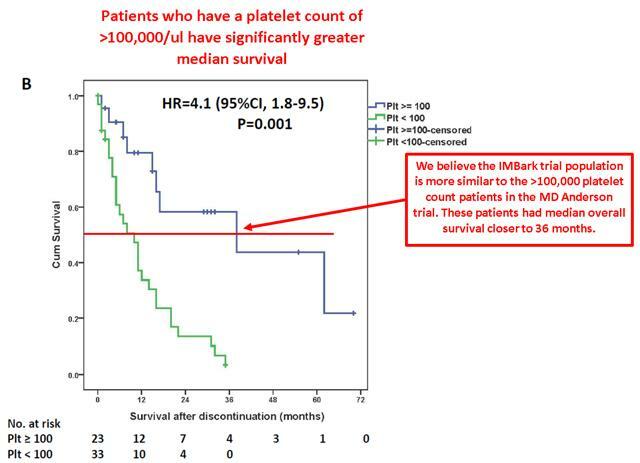 This point is crucial because when stratified by platelet count, the historical MF trials show that patients with higher platelet counts live substantially longer than the overall population of patients who discontinue JAK inhibitors. At face value, the IMbark results look very promising versus the MD Anderson results: at least 19 months mOS in IMbark vs. an expected mOS of 14 months. However, the MD Anderson trial was actually a chart review on an essentially all-comers basis and followed patients from the start of Jakafi and after discontinuation. In other words, it included all patients who discontinued Jakafi regardless of health. This can be seen in Table 1 where it shows that the median platelet count in the post-Jakafi population was 91,000/ul with a range of 11,000/ul to 922,000/ul. Because the median platelet count in the paper was so close to the allowed lower bound in the IMbark trial, a substantial portion of the patients followed in the MD Anderson paper would have been ineligible for IMbark. For reference, a normal level of platelets is 150,000-400,000/ul and mild bleeding can occur if platelets drop below 50,000/ul. We can also see that one of the patients in the MD Anderson paper had a platelet count of 11,000/ul, which is considered very low. 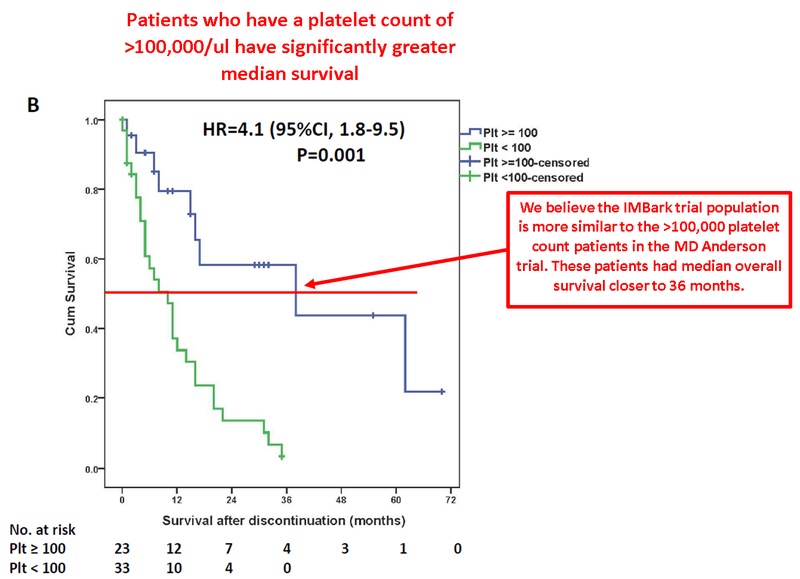 We can see later in the Blood article in Figure 2B that patients with platelet counts <100,000/ul did significantly worse in terms of survival. It appears this population had a median survival closer to 10 months. They accounted for 33 of the 56 total patients, more than half of the population, which we believe skewed the overall results negatively. Conversely, for the patients with a platelet count of >100,000/ul, it appears the mOS was closer to 36 months! We believe the IMbark patient population was more similar to the >100,000/ul population in the MD Anderson trial than the <100,000/ul population. Keep in mind that IMbark already excluded patients with ECOG scores greater than 2 and patients who had peripheral blood blasts of >10%. If IMbark, which as we showed above had a relatively healthy population, enrolled one-third of patients that should have an expected mOS of 10 months and two-thirds of patients that should have an expected mOS of 36 months, then we would expect the blended average to be around 24 months. As a result, we believe that the median OS of 22-23 months that Stifel estimates Geron is observing currently is neither impressive nor unprecedented. In fact, it’s completely expected. In addition, because the low-dose arm was essentially shut down, Janssen amended the trial protocol so that the 4.7mg/kg arm patients were allowed to crossover to the 9.4mg/kg arm at the investigator’s discretion. However, Geron stated on the recent fourth quarter 2017 earnings call that “there were a meaningful number of patients who remained on 4.7 mg/kg.” Therefore, we believe the 4.7mg/kg is a good proxy for a placebo or control arm. Since Geron and Janssen determined the 4.7mg/kg arm was ineffective, then we should expect the 9.4mg/kg arm to outperform on a survival basis, but we haven’t seen that yet, as indicated in their press release which stated: “the median overall survival has not been reached in either dosing arm.” Since the 4.7mg/kg arm was enrolled on average earlier than the 9.4mg/kg arm, a best case would be equivalent survival rates between the arms. This indicates to us that imetelstat has not had a positive impact on survival. This lack of survival efficacy matches the lack of efficacy in traditional endpoints associated with MF like spleen volume, which Geron and Janssen announced in April 2017, and we believe it corroborates our view that imetelstat is not effective in MF. Lastly, we point out that Janssen has essentially delayed its decision on imetelstat multiple times. A decision was originally expected in 2016 and then in 2017. If imetelstat truly offered a 4-6 month or greater survival benefit, we believe Janssen would have opted into imetelstat by now. Instead, Janssen stopped enrollment in September 2016 and has been waiting until the last moment to make a decision. To us, this seems like more of a Hail Mary than a strong indicator of efficacy. 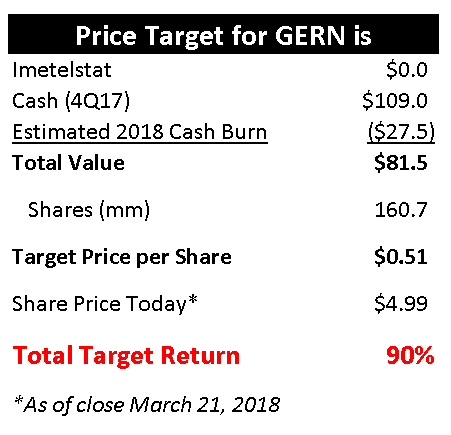 We are short Geron with a price target of $0.51. We believe imetelstat will be returned by Janssen and value it at $0. Disclosure: I am/we are short GERN.